Welcome to Corporate Gifts and Awards, your ultimate source for executive achievement awards, corporate giveaways and customized promotional items. Our collection of trophies and awards feature hand-selected items sure to impress executive gift recipients. All of our items can be customized with a company logo or artwork & our staff is there to assure that the end result is held to the highest degree of perfection that your company needs to portray. Whether you're seeking an inexpensive promotional giveaway item or a one of a kind award to present, Corporate Gifts and Awards is your source! 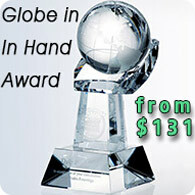 Custom Awards of Crystal, Bronze, and Marble. Awards for corporate recognition or appreciation. Retirement awards. Awards for employee recognition. Plaques and Trophies. Award engraving including logos. Personalized awards. Many awards made in America. 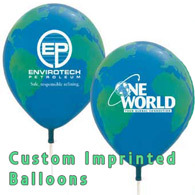 Custom Balloons and PVC Inflatables - Globe Balloons, Advertising Balloons, and Imprinted balloons. Balloon imprinting for corporate promotions and events. Custom balloon printing with your logo or artwork and personalized balloons. Custom printed balloons are perfect for trade shows, celebrations, holidays, and weddings. Eco-friendly biodegradable latex helium balloons. Custom Molded Chocolates for Promotional Gifts. Create your own chocolate designs, chocolates can be custom branded with your logo. We carry a wide range of chocolate gifts including promotional chocolate, imprinted chocolate, and custom boxed chocolates. Only finest quality Swiss chocolate is used in our custom chocolate products. These delicious molded promotional chocolate gifts are all made in the USA. All chocolate is certified kosher dairy and has a shelf life of 1 year. A Wide Selection of Gift Clocks that Can be Custom Imprinted or Engraved with Your Company Logo. These clocks make excellent business gifts for promoting your company. Your top clients and business associates will surly appreciate one of our high quality gift clocks. Also a great executive gift item. A selection of seeded paper products and seeded paper gift items. Unique and 100% environmentally friendly. These promotional products feature handmade paper embedded with a variety of annual and perennial wildflowers. Print your next green promotion on Earth-friendly seeded paper. A great way to put something back into the earth. This specialty seeded paper is made from 100% post-industrial, recycled paper and dyed with all-natural, vegetable-based pigments. Printing is done using water and soy based inks. A fully-plant-able promotion with no waste. Paper biodegrades leaving the embedded seeds to germinate and bloom into wildflowers. People around the globe find these to be among the most personal and inspiring promotions available. If you require a custom promotional product, award, or imprinted gift within a very short timeframe we offer a wide selection of items available with 1-day rush service. Available on orders that require only single color, single location imprints. Orders placed before 11am PST are eligible to ship the next business day. Eco-friendly promotional products, client gifts, and recognition awards. A selection of great promotional ideas that are environmentally friendly. Green promotional products, gifts and awards that are either made of re-claimed materials, recycled materials, recyclable, biodegradable, energy efficient, or made from sustainable rapidly renewable resources. 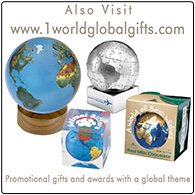 These promotional gift items, trade show giveaways, and awards are all made in the United States. When you need a promotional product, award, or personalized gift that was made here in the U.S. our wonderful selection of hand picked items will surely suit your needs.